Now reading:Exactly how amazing is the Tesla Roadster 0-60 mph in 1.9 seconds? Exactly how amazing is the Tesla Roadster 0-60 mph in 1.9 seconds? 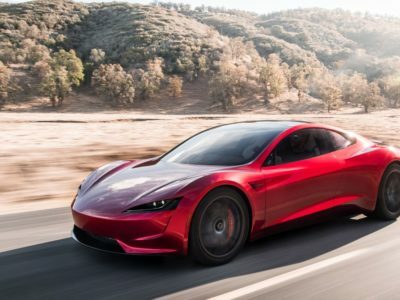 Tesla’s new roadster can achieve 0-60 mph in 1.9 seconds. The million dollar Bugatti Chiron does it in 2.5 seconds. The first question to answer is what is the limiting factor for maximizing acceleration. The answer is the tires (for low speeds). The limiting factor in acceleration is the tires. Imagine that you have a car with a huge engine and you max the throttle. What will happen? The wheels will just spin and you won’t move forward at all. The tires can only take so much power to propel you forward before they slip. To achieve max acceleration, you want to be at the bleeding edge of slipping without actually slipping. So to estimate the theoretical fastest 0-60 time as a back of the envelope calculation, we can focus on the tires. Air resistance, aero-dynamics, and down force have a much small effects at low speeds and we can ignore these factors for a simple analysis. The Tesla roadster uses street tires that are street legal. These are not the gummy F1 times that melt to grip the road and disintegrate after a few laps. We can look at how tires perform by looking at braking distances, in particular those from a starting speed of 60 mph. Slamming and locking the brakes will take longer to stop than a car with the latest electronic anti-lock traction-control brakes. These high tech brakes are hyper optimized for stopping the car as fast as possible with the tires right at the edge of slipping, but without slipping. In geek speak, the coefficient of kinetic friction is lower than coefficient of static friction. Now lets flip this around. You can estimate max acceleration by looking at max deceleration. A car’s max acceleration will always be lower than its max deceleration. This is because gear box shifting introduces lag and inefficiencies. But the point of this exercise is to to find out the max acceleration if there were no gear box holding you back. By the way, electric motors have no gearbox, and this is the advantage that Tesla gloriously relishes in. We can gauge max deceleration by looking at braking distances from 60mph. A good breaking distance for a street legal car is about 90 feet. The theory is that we take this stopping distance as a metric for max deceleration and use it to estimate max acceleration. Then we can come up with a theoretical fastest 0-60 time. Now, remember your high school physics equations of motion. For the car to stop, all the initial kinetic energy must be stopped by the braking force applied by the tires to the road. Energy is conserved, thus we can equate the kinetic energy equation to the work equation. The force applied by the braking can be substituted via Newtons law with mass times acceleration, F = ma. The mass drops out from both sides. This means that the max acceleration for a car with street legal tires (at low speeds) is independent of the weight of the car. Dividing d from both sides gives us the equation for deceleration as a function of initial velocity and stopping distance. The v is 60 mph and the d is 90 ft. We will let google do the unit conversions for us. Copy paste this in the google search bar. You will get 29.3 mph/s. This means that the fastest you can decelerate a car is about 29 mph every second using street tires. Don’t try this at home because after taking human reaction time into account … real life stopping distances are closer to 190 feet for 60 mph. Now using the acceleration equation we can calculate the 0-60 time. Dividing a from both sides gives us the equation for time. And you will get 2.05 seconds. So now, you should be even more impressed that Tesla’s Roadster can do 0-60 in 1.9 seconds. It is literally faster than simple physics. As a MIT mechanical engineer, I am fascinated by this. Now for the shameless plug for CALLENQ … changing gears here. It is so crazy fast that I am sure even Elon would be proud. Drizzle Drazzle Druzzle Drone, time for this one to come home.